BritishIndia, established in 1994, is one of Malaysia’s most recognised home-grown luxury fashion brands, inspired by the grand romance of the Colonial era. With seven collections to meet the various lifestyle needs of people who care about quality, BritishIndia has more than 40 outlets across Malaysia, Singapore, Thailand, and the Philippines (as of 2017). Our role in the design development of BritishIndia as a luxury brand is closely tied to our story of Metrojaya. 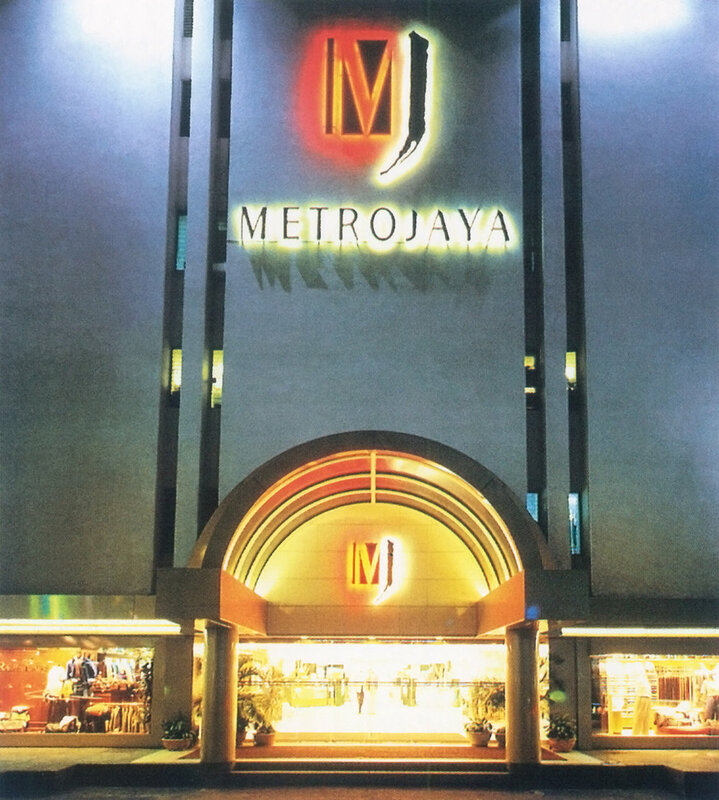 Metrojaya was Kuala Lumpur’s premier luxury department store in the 1990s. Its management requested their advertising agency, J. Walter Thompson (JWT), to do an internal pitch between the Malaysia, Singapore, and Thailand offices to rebrand the department store. The Malaysia office, in turn, commissioned us to work on the project; and in an unexpected turn of events, we won the bid. Working in collaboration with JWT, our team designed Metrojaya’s new logo and identity. The department store had an acronym ‘MJ’ which the public was familiar with, but did not exist as an official logo. The new identity was built around this acronym with a brushstroke ‘J’ to evoke its Asian roots and a personal touch—the next logical step in the brand’s evolution. Façade of Metrojaya flagship store at Bukit Bintang Plaza, 1996. Metrojaya was Malaysia’s fastest growing retail chain with four department stores and over 40 specialty stores throughout Malaysia and Singapore. In addition to Metrojaya’s new logo, we also designed the brand identity for a range of fashion labels, including East India Company and Somerset Bay. When Metrojaya was sold to Malayan United Industries Bhd (MUI), Ms. Pat Liew, the former Merchandising and Fashion Director, and Shareholder) lost the intellectual property of all her fashion brands to the department store. We took a purely typographic route in the design of the BritishIndia logo, which was later supported by a symbol-mark. BritishIndia’s first symbol-mark (which we inherited) was too detailed for reproduction at small sizes. It was an illustration of the intrepid explorer, Ms Isabella Bird, riding an elephant. Overcoming poor health as well as the limitations of living in a man’s world, Isabella Bird (1831–1904) became a writer, photographer, and naturalist. She was also the first woman to be elected a Fellow of the Royal Geographical Society. Isabella subsequently wrote a book about her travels in the Malay Peninsula titled The Golden Chersonese, and was an inspiration for the label’s adventurous spirit. The symbol-mark underwent a number of refinements but was eventually dropped, replaced by a lively, playful elephant. BritishIndia took off quickly as a fashion label, with four outlets in Malaysia within months, and another four in Singapore in the mid–late 1990s. This rapid exposure can largely be attributed to the late Yasmin Ahmad, who launched the brand with a controversial but tongue-in-cheek headline: Presenting BritishIndia, an era of racism, oppression, injustice and nice outfits. From the beginning, we had settled on using the Asian elephant as the brand’s icon because of its importance to India and other Asian countries. By now, the BritishIndia elephant has come onto its own and projects a playful persona, taking on the derring-do and adventurous spirit of Isabella Bird. The entire label system was reworked with current and new sub-brands to promote a clearer and more unified visual identity. For instance, a silhouetted elephant was introduced to simplify production. Additionally, JustB—formerly an independent brand—was brought also into the collection. Previously represented by an elephant with a princess crown, the crown was removed as part of the icon because JustB was has shifted from their original target market—girls in their late teens—to a different one: young working women looking for softer, more comfortable clothing. 20 years on, the concept of the original advertisement was revived for an announcement card to signal the next phase of BritishIndia’s enduring brand.